Joseph Donnelly (Tom Cruise) is an Irish farmer whose family home is burned on the orders of his landlord Daniel Christie. His attempt to murder Christie ends in failure when he is stabbed in the leg by Christie’s headstrong daughter Shannon (Nicole Kidman). Before he can be executed for his crime, Joseph is rescued by Shannon and taken on a journey to the Americas to find a new life. 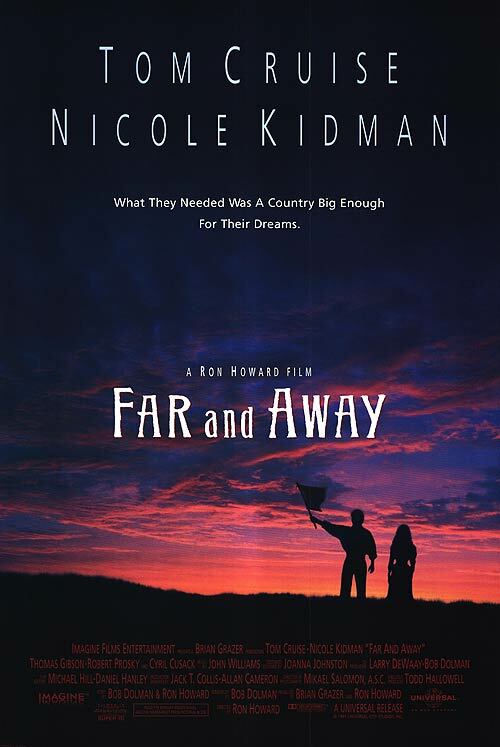 Far and Away is a sweeping romantic drama directed by Ron Howard and starring the then-married couple Tom Cruise and Nicole Kidman. It must be said from the outset that it is a visually gorgeous epic, shot in the same Super 65mm format that was used on Lawrence of Arabia (1962) and 2001: A Space Odyssey (1968). It made the wide America vistas of the film’s third act look tremendous, and even pulled back to a bluray format the visual quality of the film continues to marvel. The Oklahoma land rush in particular is outstanding: an action scene produced on a phenomenal scale, with hundreds of riders on horseback and rickety wagons racing to claim parcels of land by ramming personal flags into the ground. Similarly eye-catching is a series of bare-knuckle boxing matches in Boston midway through the film. Howard has shot and edited these scenes to really make the force of the punches pop. If only films could be judged on their visual imagery alone. The problem is that visual imagery is almost all Far and Away has running in its favour. The rest is a terribly unconvincing and two-dimensional romantic saga, boasting thinly-drawn characters, weak performances and more cultural stereotypes than you can mutter ‘begorrah’ at. As a broad Hollywood entertainment for the big screen it partially succeeds, but its lustre fades quite quickly on home video where the smaller scale of the presentation brings its shortfalls into sharp relief. Both Tom Cruise and Nicole Kidman struggle valiantly with their Irish accents, but fail by a fairly wide margin. It is a typical problem for many actors who lack an instinct for accents: they concentrate so hard on maintaining an accent they cannot actually manage that they fail to realistically emote. I have liked both actors in other roles, but they are relatively painful to watch here. The supporting cast fare little better. Thomas Gibson does the requisite sneering and snarling as Shannon’s arrogant well-to-do suitor Stephen Chase. Robert Prosky and Barbara Babcock are oddly unlikeable as Shannon’s wealth land-owning parents Daniel and Nora Christie. Joseph’s family home is burned to the ground by Stephen, but he is acting on Daniel Christie’s behalf – and the film does not do nearly enough to vindicate Christie of that crime. What is worse, by the time the film hits its land-rush climax Christie and his wife are out in Oklahoma not only claiming fresh land but actually cheating the agreed process to secure it. While the film may play it for a spot of humorous relief, given Christie’s long history of exploiting poor Irish people the sight of him cheating a new system for his own advantage is not remotely funny. It is tonally misjudged to say the least. The plot is thin enough that one could comfortably write it on a postcard. Joseph and Shannon meet, and hate one another, but really love each other. Her arrogant hopes for life in America are dashed, but his are fulfilled. Then his are dashed and she is taken away from him at the exact moment they admit their love. Then they are reunited just in time for Joseph to confront Stephen and claim a plot of land all of their own. Cue the relatively insipid end titles music by Enya. It is all so blandly similar to James Cameron’s Titanic that I do wonder if Far and Away was an inspiration for Cameron’s film: the lower-class boy and the lower-class girl, the arrogant mustachioed villain, the love affair caught up in the sweep of history, the overly saccharine musical score (here it is by John Williams, doing a bizarrely noisy and over-prescriptive job of it). Both films succeed as spectacle but fail as storytelling; we have simply seen it all before.